For those of us with sensitive acne-prone skin, it can be a challenge finding a gentle face wash that doesn’t irritate or over dry our skin. As you probably already know, most commercial cleansers contain a slurry of emulsifiers and sulfates that strip the skin’s natural oils and destroy its natural protective barrier. To put it simply, these cleansers (even most of the natural ones!) are just too harsh for us sensitive skin types. The good news is there are many alternatives that you can make at home in your own kitchen that are both safe and effective. The only drawback for some people is that this face wash recipe does not leave your skin with a squeaky clean feel… but guess what? That’s a good thing! Any cleanser that leaves your skin feeling squeaky is too strong for your skin type. You might think that using something as simple as clay and honey won’t actually clean your skin, but they do. I think you will be surprised by how soft and moisturized your skin feels after using this cleanser. Even if you don’t have sensitive or acne-prone skin, you can still benefit greatly from switching to a natural homemade alternative. Using a gentle homemade cleanser won’t cure your acne, but it will definitely improve it since you won’t be bathing it in chemicals anymore. This face wash is so easy to make and will keep indefinitely so long as no water gets in it. To avoid this from happening, simply scoop out a small portion with a clean dry spoon as needed. I encourage you to read this post if you want to learn about which essential oils are best for your skin type. The clay will help draw toxins from the skin and calm inflammation. Depending on which clay you use the benefit you’ll experience will be slightly different. You can even blend different clays together to make an extra special clay face wash. Experiment and have fun! Have you ever used a clay and honey face wash before? Please share in the comments! Hello, Can I add Tocopherol Oil / Almond Oil into the recipe? Would it affected the shelf life of the product? As long as you don’t get any water in the finished product, it should stay fresh for months! 🙂 The honey is antibacterial too which helps extend the shelf life. My rule of thumb is, if it smells or looks “off”, chuck it out! Hello! I have been researching cleansing grains and subsequently various clays for facial use. I was wondering if you could give me a recommendation for my dilemma. I was thinking I would get a clay to try but I was really wanting to get something that I and my twin daughters (12) could use as well. The problem is that we have such different skin types. I have pretty normal skin. I get a blemish here or there but generally are not very oily or acne prone. Both of my daughters have oily skin and are acne prone with a considerable amount of black heads. The main issue is that one my girls has very sensitive skin. We are talking battling eczema and her allergist telling us to switch to non-scented everything! (It is under control btw.) SO…I’m sure you understand now. Is there something that we can all use or do I need to get three distinct masks to each have their own? Feel free to email me if it would be easier for you at NaptownAngel06@aol.com with any advice or resources that would be handy. Thank you for any help! For the girls I would use kaolin clay as it’s the best for sensitive skin types yet still good for acne, but you could use rhassoul clay (aka moroccan red clay) on the blackhead prone areas. For your skin, I think rhassoul clay would work really well! Hi! Do you think it would impact the shelf life to add activated charcoal in addition to clay? Nope! 🙂 The key is to keep water out of it during storage. Is Rhassoul clay and french red clay the same type of clay? Thanks for the recipe! I purchased the honey that you recommended and see that it is solid. Do you typically use it in its solid form or do you heat it up to liquify it? Hmm.. I always suspect that 100% concentration of essential oils is not good for me. My sis sells 100% pure argan oil and gave me one to try on my face. The result was devastating to my face. Thing is, I think that 100% pure essential oil is not good for me. I use products which are not 100% in their essential oils. Like I have a soap that has 70% palm oil but it never broke me out or gave me bacne (I use it for both my face and body). So I think that it really depends on other people. Some are okay if they use potent essential oils while some are not. I used a skincare from Korea with high concentration of snail slime (it was the hype in Korea) and it broke me out. Turns out that it was 92% high concentration of snail slime. The high levels of concentration was too high for my combination skin so I gave it to my mother lol. I’m planning to make my own homemade facial wash as a substitute for soaps or other cleaners and at this time, I’m contemplating whether to put at least 2 drops of argan oil or more (but the bottle I’m going to reuse is pretty big so I’m wondering how much drops is the safest for me). Those with sensitive skin should NEVER put essential oils on their faces. Ever. If you add essential oils to this cleanser (which otherwise sounds amazing, thank you for sharing!) it would not be appropriate for someone with reactive skin. Just think about, essential oil are basically an incredibly concentrated essence of the plants, there’s tens if not hundreds plants in a 10 ml essential oil bottle, something this potent is, well, very potent. And while tea tree oil does have antibacterial properties lavender offers absolutely zero benefit to the skin, especially sensitive skin! Its SMELL has calming properties, that does not mean the essential oil will calm your skin. In fact, lavender oil is one of the most notorious irritants in skincare, especially creams, it’s right up there with artificial fragrance unfortunately. I mean if it works for you that’s great, but I really believe people should be more aware of this and stop branding it as a skin calming ingredient. I’ve been researching into clay masks and cleansers, and I’d like to use your recipe! Quick question: can this clan/honey face wash be used 2x a day? It seems like it’s supposed to replace the store cleanser overall. At night, I like to wash my face…in the shower cause I’m already wet ahaha. Should I put it on as a mask and then shower? Cause moisture is not supposed to get into the jar…but if you’re already in the shower and you’re trying to scoop some out, water drops are bound to get in. Yes! it can last for a long time as long as you don;t get any water in it. The honey will keep everything preserved perfectly for months. To make a larger batch is simple, all you need to do is measure out about 1/3 cup of honey and add 2 TB or more of clay. This recipe does not have to be exact in order to work so feel free to change it up. Best of luck! You can definitely use this clay face wash twice a day in place of a normal face cleanser. if you;re wearing a lot of makeup you will want to remove that with some non-comedogenic oil like jojoba. Your idea about putting the face wash on as a mask before getting in the shower is a great idea! it is difficult to keep moisture out of the jar. I actually use a squeeze bottle now and it works really well! Does the mixture separate? I plan to store it in a face wash tube. This sounds really nice and simple! Do you know if I can add lecithin to make it a little creamy? I’m not sure about adding beeswax unless you were making a cream/cream cleanser. I have never tried it. If you do, let me know how it turns out! I was told never to use anything metal with Bentonite clay, like whisk, forks, etc. 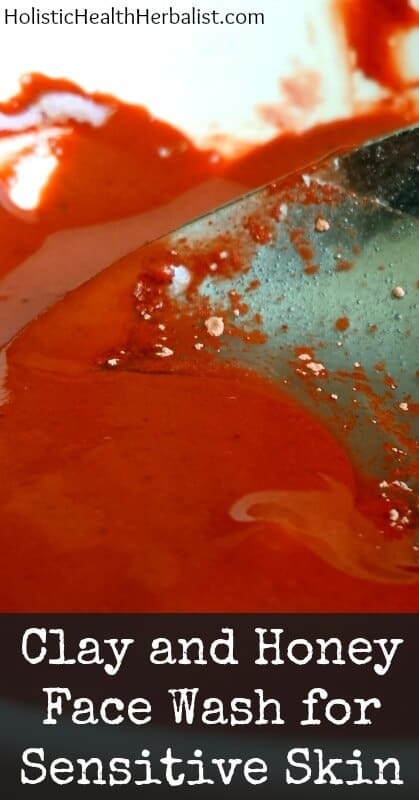 The metal utensils react to the clay. Are all clay BRANDS considered equal for the most part? I think the rhassoul clay would probably work best for my skin type considering the descriptions of each clay. However the amazon link you kindly provided was quite spendy for a small amount. Would a different brand of rhassoul clay give me the same results? Where can I buy these types of clays? Do I need to remove my makeup before using this as a cleanser, or can I just put it on my face in the shower when I would normally remove my makeup with my facial cleanser? i make this same mask!! i use bentonite clay and raw honey. i usually add a few drops of orange essential oil and cinnamon. smells really nice and makes my skin so smooth.